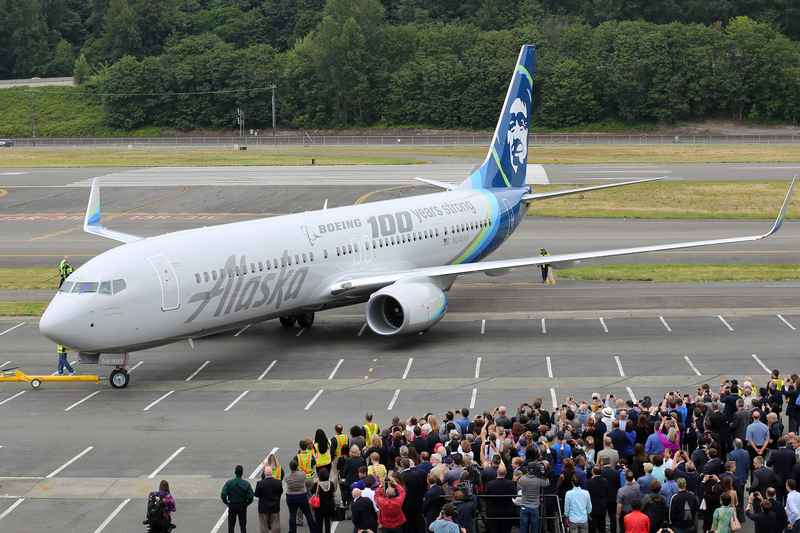 2016: Alaska unveils a special livery dubbed “Celebration of Boeing,” to honor Boeing’s 100th year. 3 p.m. June 30, 2016 update: Broadcast quality b-roll and photos of Alaska’s June 30 Boeing centennial event are available for download at the bottom of this post. 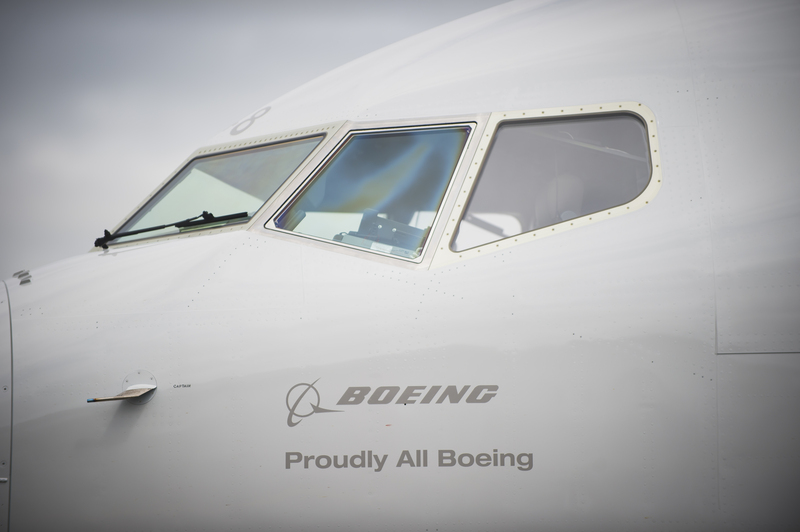 This summer, The Boeing Company celebrates its 100th anniversary. With its Commercial Airplanes division based in Seattle, the company traces its beginning to July 1916, when Bill Boeing and a few fellow engineers formed Pacific Aero Products Company, which was renamed The Boeing Airplane Company in 1917. 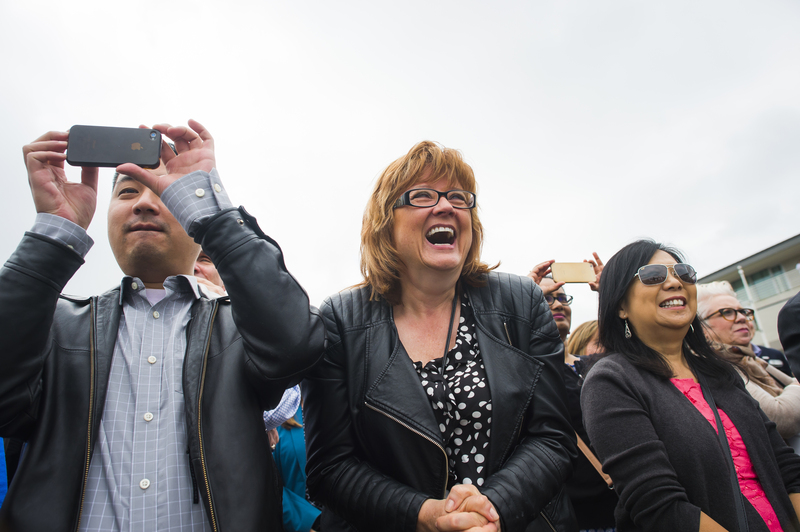 Boeing employees include more than 77,000 who live and work in the Pacific Northwest. Together, these folks build incredible airplanes. Boeing is our country’s leading exporter and has been a driver of economic growth in the Pacific Northwest for many decades. 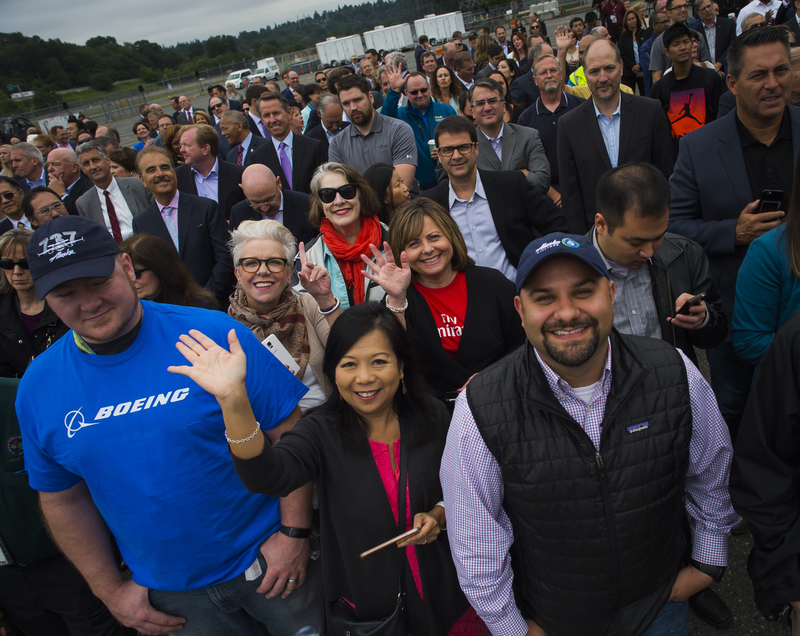 Houses have been bought, mortgages paid, kids sent to college and food put on the table—not only for the people who work directly for Boeing, but for untold families and communities that have benefited from the thousands of jobs created to support the manufacture and sale of Boeing airplanes. With Alaska Airlines’ home base located a mere 5 miles from where our airplanes are built, it has been our privilege to work with and get to know the people who run Boeing. Ray Conner, Boeing Commercial Airplanes’ talented CEO, is truly a hometown guy, having attended Highline High School just west of Sea-Tac. Ray joined Boeing as a mechanic on the 727 program in 1977 and, after serving in a number of roles throughout the company, was appointed CEO in 2012. Over his nearly 40-year career, Ray has earned a reputation for doing the right thing, both for customers and for employees. Many leaders aspire to this worthy goal, but Ray has actually done it—and it is our honor to know Ray and the rest of his leadership team. It would be difficult to overstate the impact Boeing has had on the economy of the Pacific Northwest and on aviation globally. If you doubt this, visit virtually any airport on the planet and you are likely to see airplanes built by Boeing employees. From Bill Boeing’s determination to design a more efficient biplane to the launch of the first dedicated passenger aircraft in 1933, to the multi-decade evolution of the 737—the most popular commercial jet aircraft ever made—to today’s Dreamliner, Boeing has had a lasting impact on air transportation throughout the past century. In honor of Boeing’s 100th anniversary, we painted an airplane in a special livery. You’ll see it flying this month. For those who have worked or provided support for Boeing over the years, this livery is our tribute to them and the terrific airplanes that they helped build. I hope you will join us in celebrating a century of achievements by The Boeing Company. 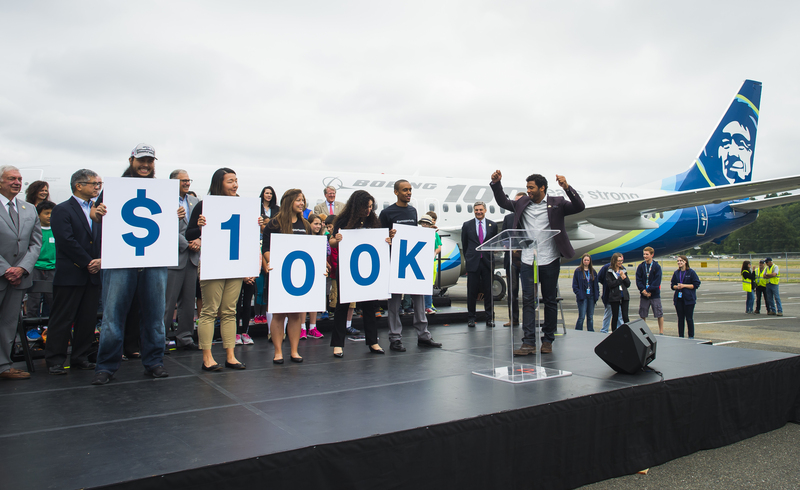 Hundreds of local business leaders gathered Thursday, June 30, 2016 at the Museum of Flight to kick off a summer of celebrations for Boeing’s 100th birthday. 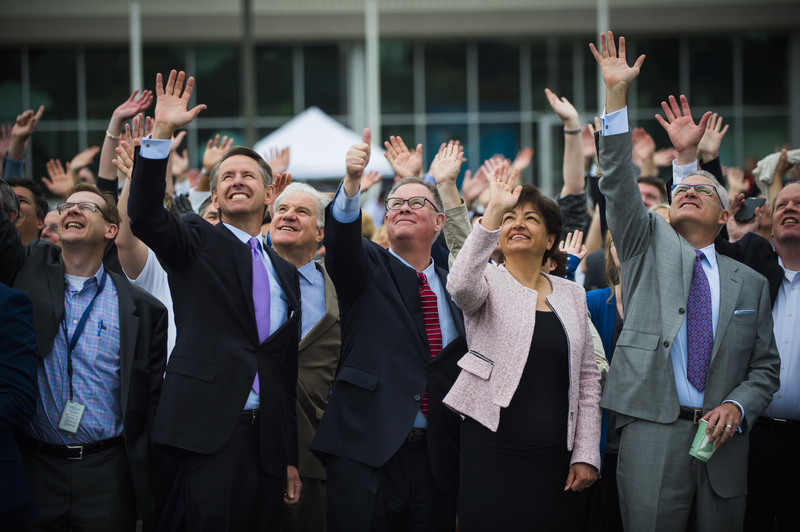 Alaska Airlines CEO Brad Tilden, left, and Boeing Commercial Airplanes CEO Ray Conner wave at a crowd of hundreds of local business leaders gathered Thursday, June 30, 2016 at the Museum of Flight to kick off a summer of celebrations for Boeing’s 100th birthday. 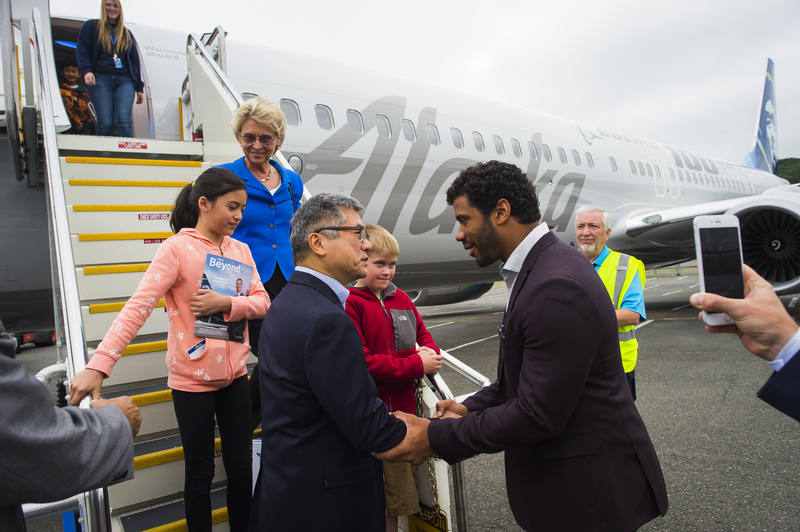 Seattle quarterback Russell Wilson, right, greets former Washington State governor Gary Locke in front of the “Celebration of Boeing” aircraft at a gathering in honor of Boeing’s centennial at the Museum of Flight on Thursday, June 30, 2016. 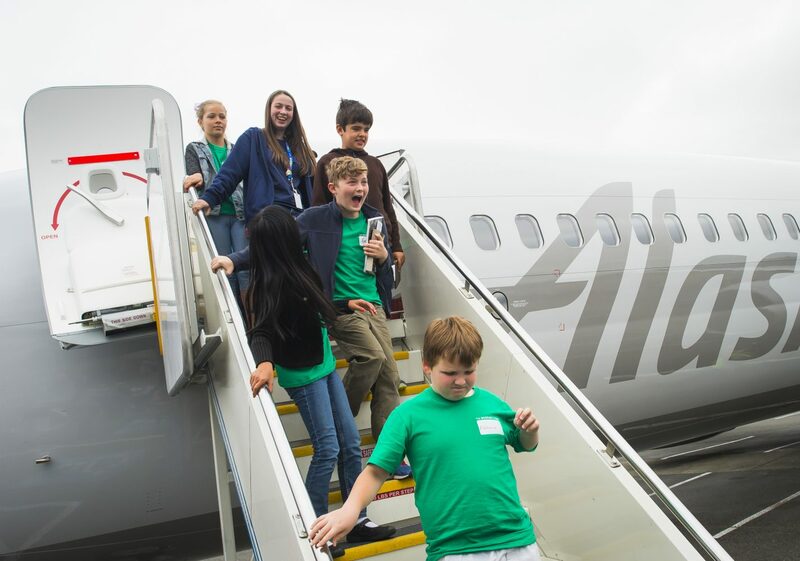 Campers from the Museum of Flight’s Aerospace Camp Experience arrive on the first passenger flight of Alaska Airlines’ brand-new, custom painted “Celebration of Boeing” 737 on June 30, 2016. 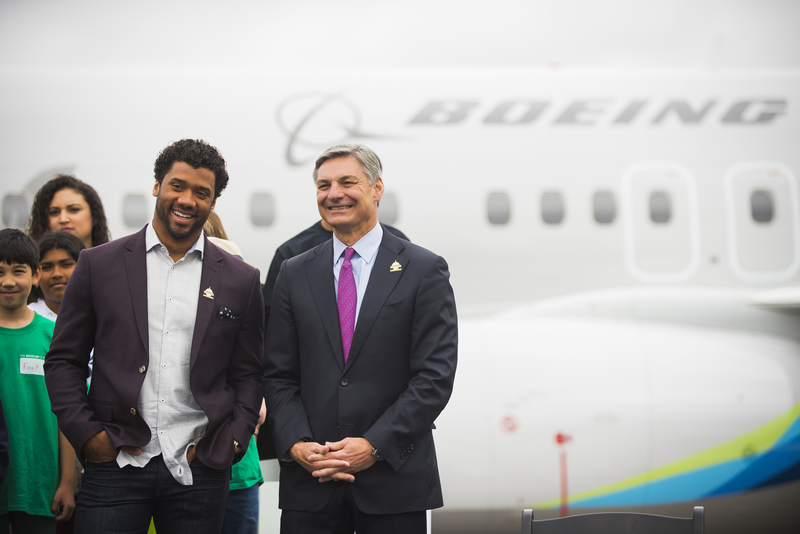 Seattle quarterback Russell Wilson and Boeing Commercial Airplanes CEO Ray Conner stand in front of a crowd of hundreds of local business leaders gathered Thursday, June 30, 2016 at the Museum of Flight to kick off a summer of celebrations for Boeing’s 100th birthday. 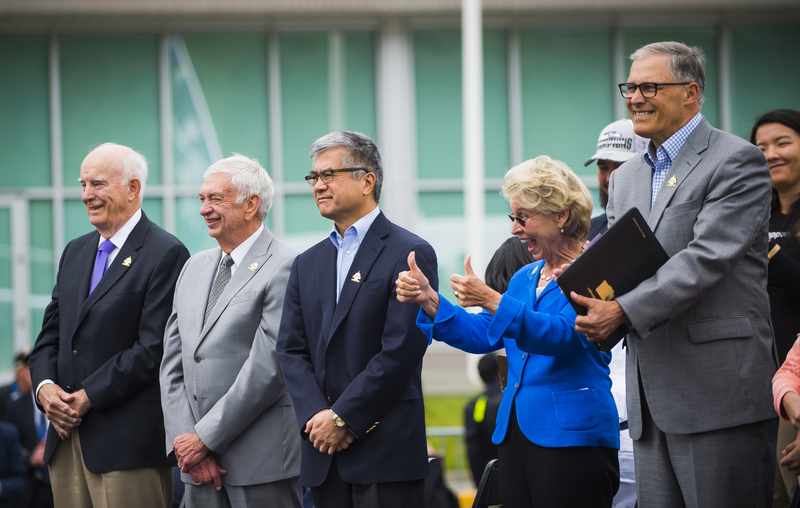 Former Washington State governors Dan Evans, l-r, Mike Lowry, Gary Locke, and Chris Gregoire join current Governor Jay Inslee at an event in honor of Boeing’s 100th birthday at the Museum of Flight on Thursday, June 30, 2016. Alaska Airlines and local business leaders present a $100,000 donation to the Washington State Opportunity Scholarship in Boeing’s name. 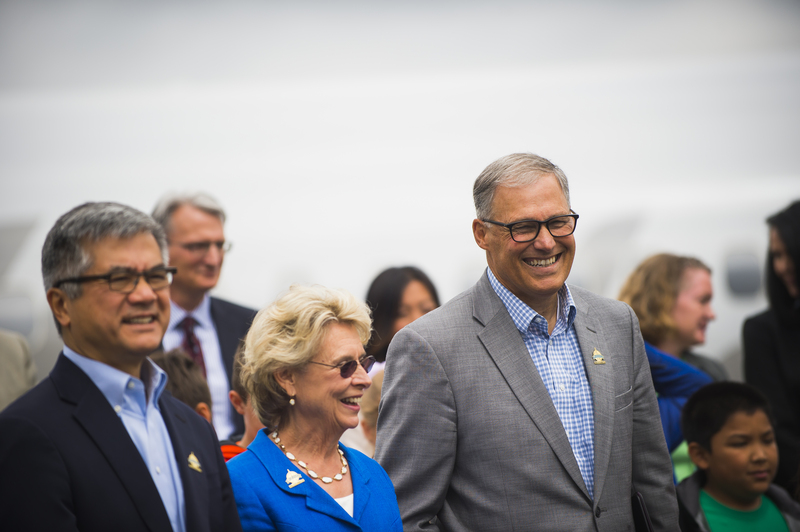 Washington State Governor Jay Inslee, right, smiles while attending the an event in honor of Boeing’s 100th birthday at the Museum of Flight on Thursday, June 30, 2016. 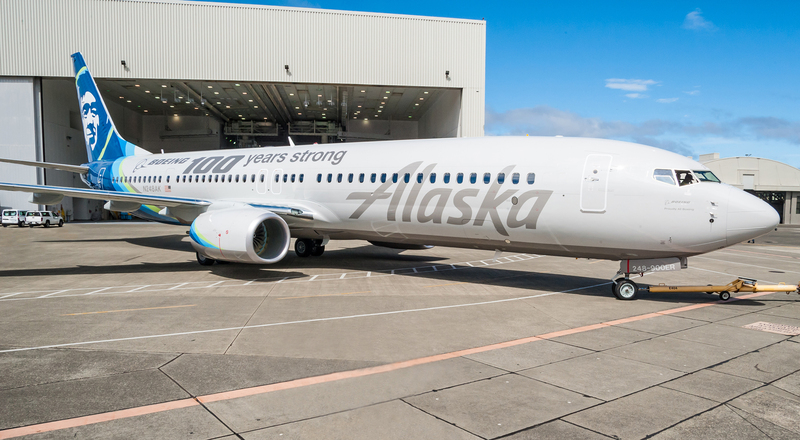 Alaska Airlines unveils a brand-new, specially painted 737, dubbed “Celebration of Boeing” in honor of Boeing’s centennial at the Museum of Flight on Thursday, June 30, 2016. 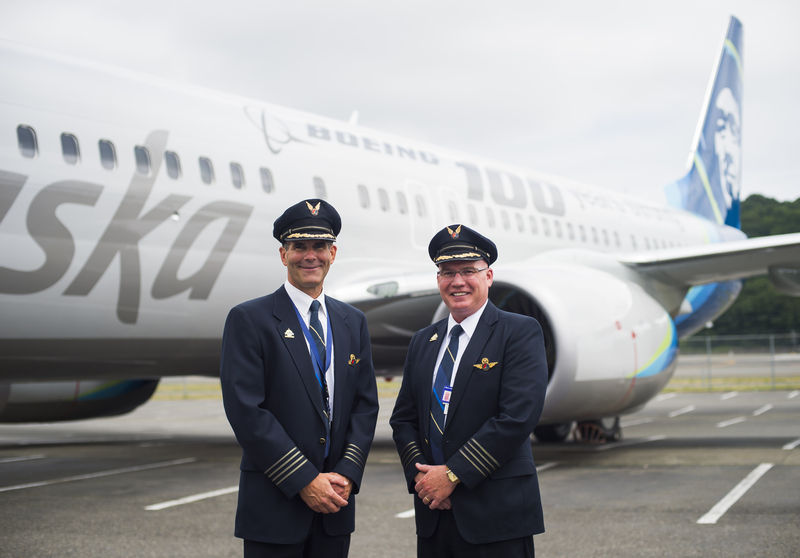 Alaska Airlines captains Brian Holm, left, and John Ladner piloted the first passenger flight of Alaska Airlines’ brand-new, custom painted “Celebration of Boeing” 737 on June 30, 2016. 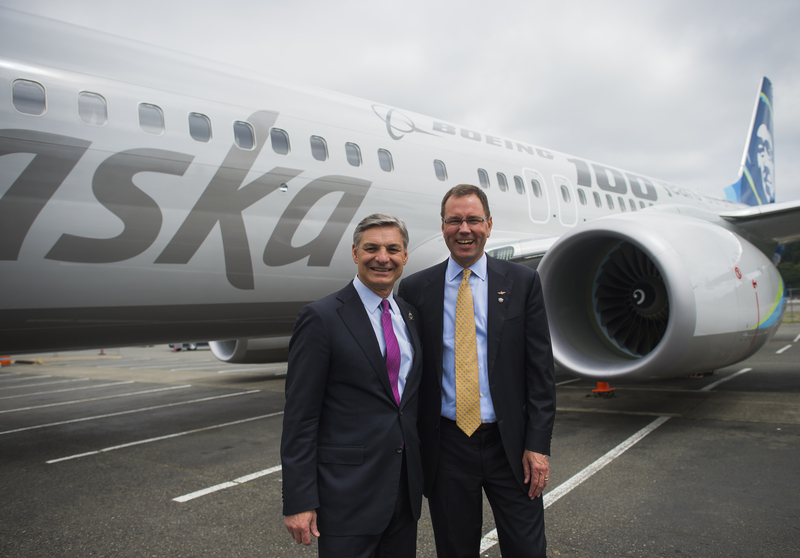 Boeing Commercial Airplanes CEO Ray Conner, left, and Alaska Airlines CEO Brad Tilden pose for a photograph in front of a brand-new, specially painted 737, dubbed “Celebration of Boeing” in honor of Boeing’s centennial at the Museum of Flight on Thursday, June 30, 2016. 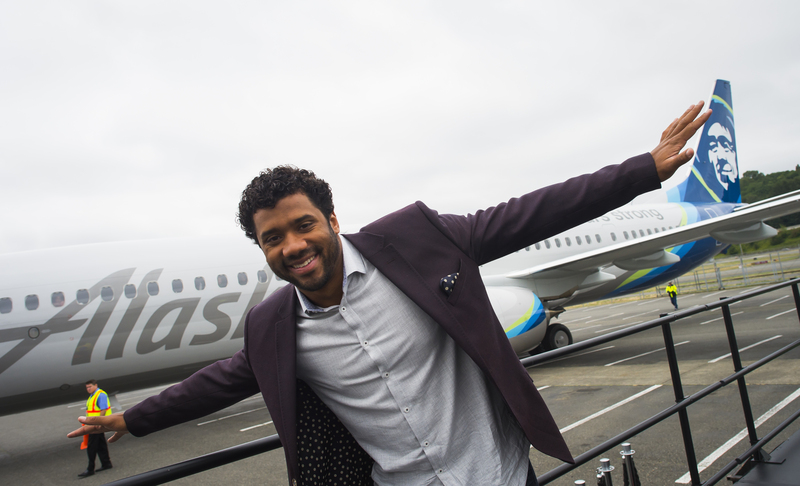 Seattle quarterback Russell Wilson poses in front of a brand-new, specially painted 737, dubbed “Celebration of Boeing” in honor of Boeing’s centennial at the Museum of Flight on Thursday, June 30, 2016. 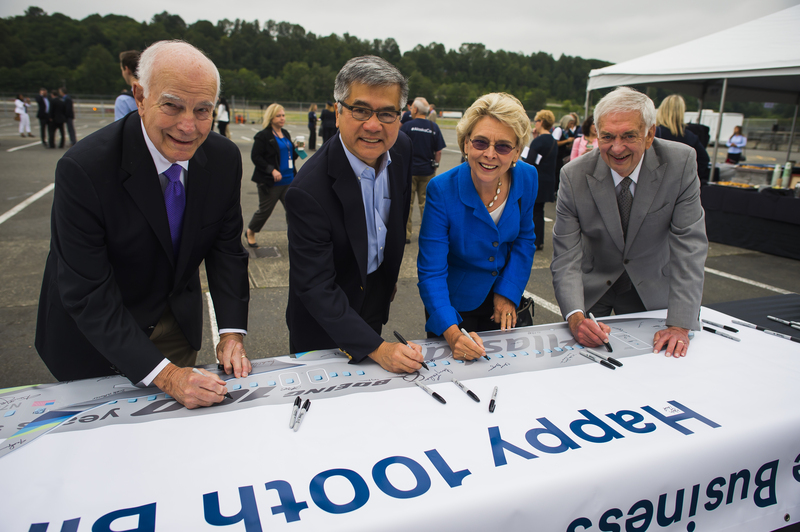 Former Washington State governors Dan Evans, l-r, Gary Locke, Chris Gregoire, and Mike Lowry sign a birthday banner in honor of Boeing’s centennial. Hundreds of local business leaders gathered Thursday, June 30, 2016 at the Museum of Flight to kick off a summer of birthday celebrations. 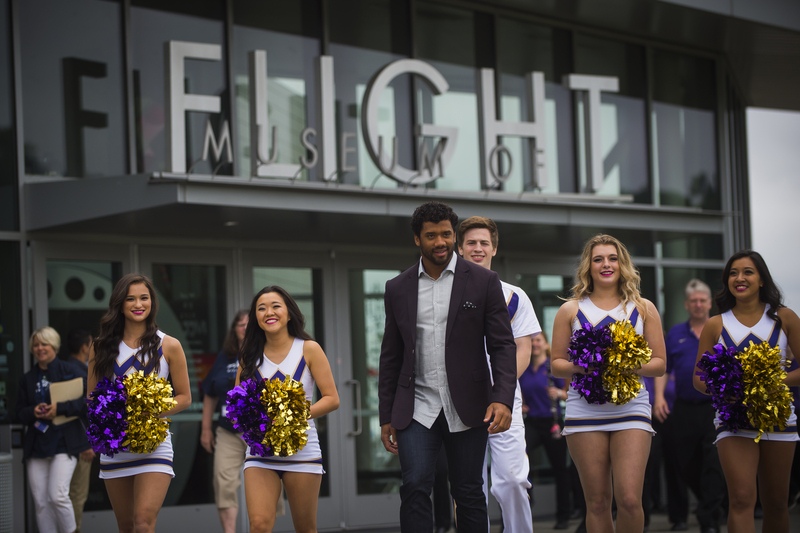 Seattle quarterback Russell Wilson and University of Washington cheerleaders walk toward a event in honor of Boeing’s centennial at the Museum of Flight on Thursday, June 30, 2016. 4 comments on "Celebrating a century of innovation at Boeing"
So proud to be a witness to long standing leadership and support in the great PNW. Well done! 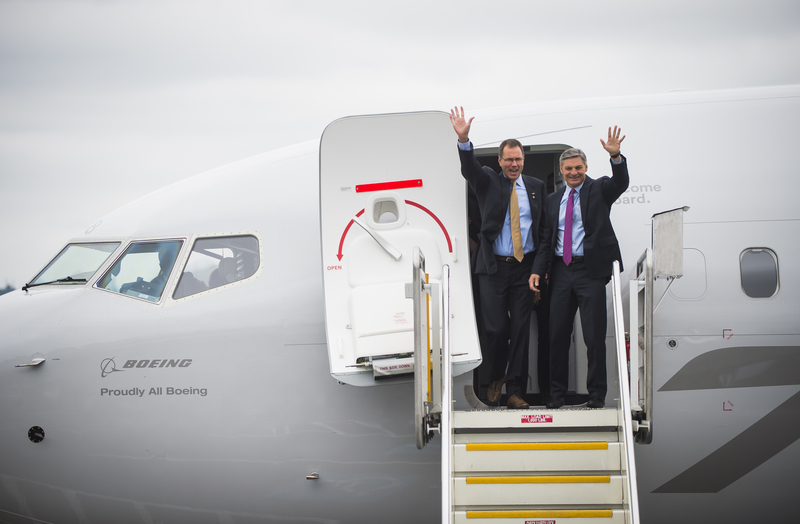 Congratulations to Boeing, one of the first of our Northwest success stories. My husband and I were born and raised in Seattle, so we both worked at Boeing at one time or another. My grandfather worked at the old plant #2 down by the Duwamish River and Boeing Airfield. I worked at the Development Center, helping to make organizational charts in Systems & Administrations (being at work the day of the 1964 earthquake!) My husband’s whole Italian family worked at Boeing. The papa, as a supervisor feeding all those six children. Two of his sisters worked at the Everett Plant (one on the field, another inside as a supervisor) My husband, worked during college, leaving to develop his own successful business. Oh yes, Boeing has helped weave the fabric of OUR lives! Congratulations Alaska for your all Boeing fleet and congratulations Boeing on 100 years of building great airplanes we love to fly in. The paint job is perfect.